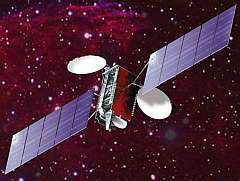 Nimiq is a series of Canadian direct broadcast satellites (DBS). The Nimiqs are owned and operated by Telesat and are designed primarily to serve the Canadian market with the capability of offering full North American coverage in the future. Nimiq 1 and 2 both carry 32 Ku-band (see frequency bands) transponders; Nimiq 2 additionally carries two K-band transponders. Both satellites launched to date have a mass of 36,000 kilograms and a service life of 12 years. "Nimiq" is Inuit for "something that unifies."